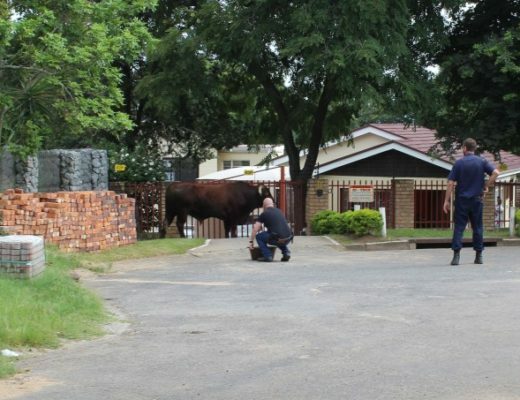 A bull found wandering around people’s front yards has once again highlighted the necessity for a farm pound in the city. 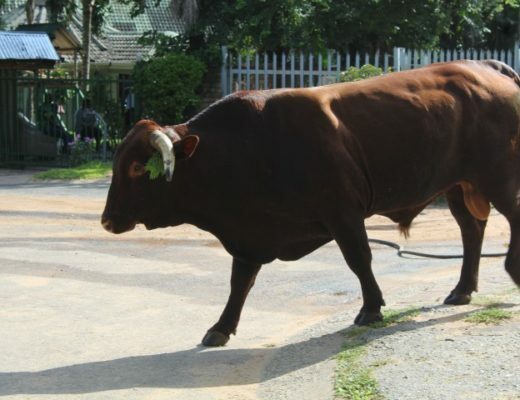 Lowvelder has extensively reported about the cattle on the city’s roads, and the threat they pose to people’s safety. They have also caused a number of accidents. Now they are entering residential areas with increasing frequency, reports Lowvelder. Last year, the SPCA Nelspruit was finally granted official pound status by the Mbombela Local Municipality. It had also requested farm pound status. SPCA Nelspruit chairperson Lize Pienaar said her main concern was to get the animals off the roads. City of Mbombela spokesperson Joseph Ngala said that meetings had taken place between their officials and the SPCA and they were addressing the challenges the organisation was having. The large bull that caused the excitement on Friday morning belongs to Roy Mdluli. 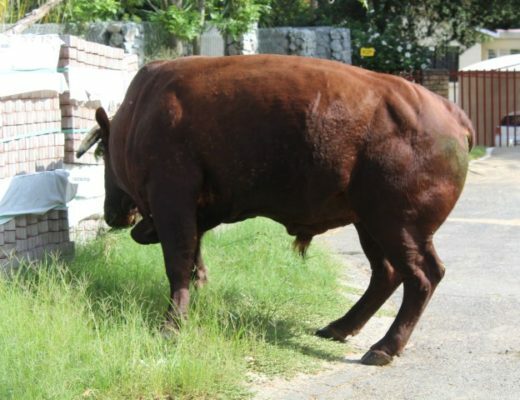 Hi-Tech Security operations manager Callum MacPherson responded to a call that morning about a bull which had wandered into a cul-de-sac area and was grazing happily on the plants next to houses, startling residents. 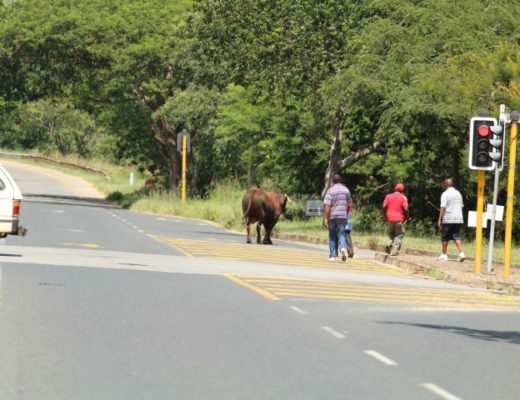 The animal had entered the city on the Kaapsehoop Road and walked casually past joggers and traffic. Lowvelder arrived to find the bull standing around looking quite bored despite a growing audience. Van Wettens Towing and security officers were on the scene, keeping a watchful eye. 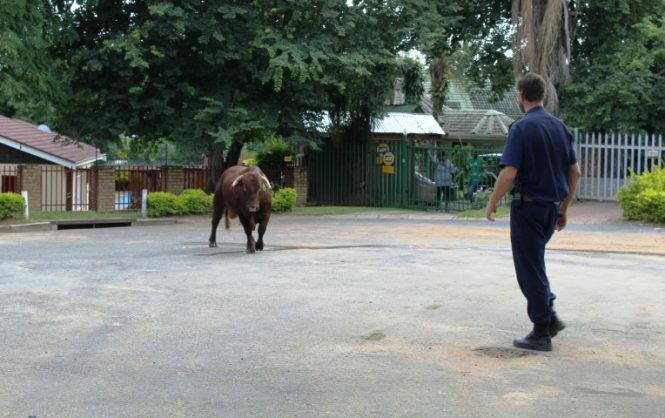 Next to arrive was Sgt Michael Horn of the SAPS, who ironically wanted to take the bull by the horns. He arranged with Divergent Ops to get a trailer to the scene. City of Mbombela municipal bylaw officers were called to the scene, but never arrived. MacPherson and his team, in the meantime, got some water for the bull from a neighbour. “Believe it or not, this is not the strangest thing that I have been called out for,” he said as he put down the bucket filled with water. After drinking the water, and looking rather refreshed, the bull started eyeing out the situation. Looking quite restless at being stuck in a corner, he tried to leave the area. 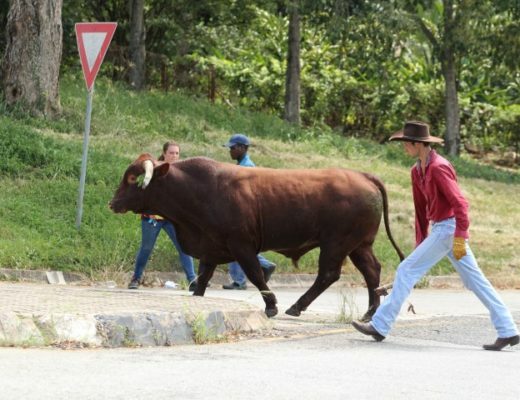 It took some matador skills to keep him penned in by security and towing personnel. A strange dance-off ensued, with bull and humans scuffling to and fro until the animal decided he would rather chew on some grass. But, it turned out this was not the first dance party the bull had attended. He had attempted to enter the city the night before. J&M Security and SPCA Nelspruit staff had managed to chase him out the city. Finally, a trailer arrived, hooked onto a Van Wettens Towing bakkie. It was reversed between bricks and some shrubbery to attempt to make an alley for the bull to enter. This time the dance got a bit more dramatic. The first attempt to get the bull onto the trailer seemed to slightly annoy him. He was ushered to the trailer, but he decided to turn around. The cowboys on the scene decided a strong rope was needed to lasso the animal. The SPCA and Pienaar arrived at the scene and told the teams that they needed a ramp to get the bull onto the trailer, otherwise he could break a leg. Grumblings in the crowd were beginning to grow that it was “three months of January” and the bull was starting to look like T-bone steaks and a couple of hamburgers. The SPCA team sped off to get a ramp and some hay. A member of the community arrived with cowboy gloves and boots to match. The bull watched, looking quite bemused. Finally, the hay and the ramp arrived. This was the ultimate moment. The teams herded the bull, trying to usher him onto the trailer once more. He was having none of that. The bull turned around and as they threw a rope around him, the animal became the winner of the tug of war competition for 2019. He let loose and stormed the crowd just as Mdluli arrived at the scene to claim him. People scattered like ants. Hardened crime-fighters ran for safety. There was not a brave matador in sight as the bull charged for freedom towards the R40. Now it was a dire emergency, the busy R40 was a danger for the animal and any vehicle passing at that moment. Quickly discovering their bravery, the crime-fighters were after him and managed to herd him around in the nick of time before an accident could occur. He was then guided by cars and people through the residential area until he was back on the Kaapsehoop Road. Lowvelder left him with Mdluli, looking like a triumphant champion that could not be caught.